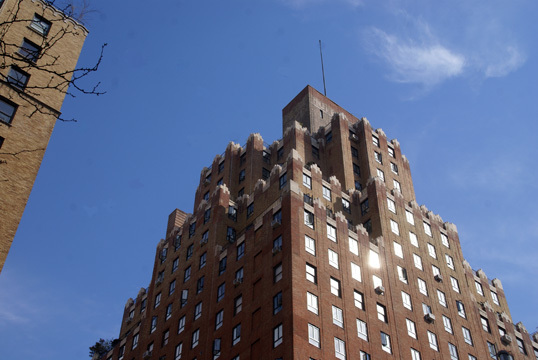 This very handsome pre-war building opened in 1931 at the Paris Hotel and it notable for the many "battelements" that top its three levels of terraces near its top. 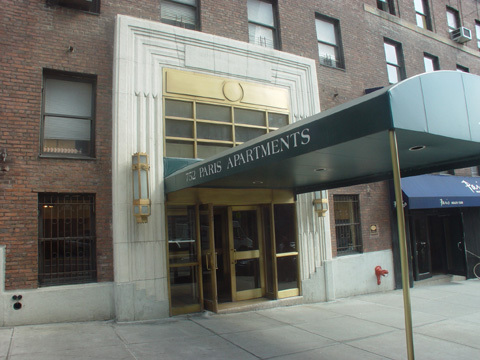 Located on the southeast corner at 97th Street, its address is 752 West End Avenue and it is two blocks from a major subway station and a block from cross-town bus service. The 24-story buildig opened with 900 hotel rooms and now has 179 rental apartments. The red-brick building has a health club with a swimming pool and was converted into a rental apartment building in the 1980s. Apartments have beamed ceiled, thermopane windows and many units have windowed kitchens and baths and separate dining areas. The building has a 24-hour attended lobby, a live-in superintendent, GE stainless steel appliances and granite kitchen countertops. The building has a rooftop solarium and laundries on each floor. According to the website wwww.nostradamus.net/McCarthy/hotelparis.htm, the architect of the hotel was Samuel Gross and the lobby has pink marble walls. At the same website, Peter Selgin submitted a comment January 20, 1967 that he had stayed there with his father "in the sixties," adding that he "loved the hotel." "I have a distinct memory of the lobby, and of the small attached restaurant, the small rooms and florid hallway carpeting. I'm a fiction writer, and a description of the hotel has wormed its way into a recent story: 'At the hotel where my papa and I slept, a black woman with fire engine red hair let me man the elevator controls. At each floor the elevator's caged doors opened to different hallway carpeting, with each pattern a teeming city unto itself, arabesques of bright color that seemed to mirror the thrilling chaos outdoors.'" Another post, "Tink," recalled living in the building in 1980 when the neighborhood "was still a bit of a 'sketchy' area at the time, but, hey, I was in my early 30s and working at Atlantic Records, so all as 'cool.' I can remember a bodega on the corner of WEA and 96th (roaches all over the place, no one spoke English, but late at night when you needed cigs, who cared). There was an original GAP on the corner of 96th and Broadway with a Latin club upstairs where Tito Puente would often play, and a restaurant named The Library on Broadway (95-94th). It had tons of old books on the walls and was a great place to brunch by oneself...."
The website said that according to The New York Times the hotel was built by the Silverman Freda Construction Corporation and that the Guardian Life Insurance Company bought it at a foreclosure auction in 19933 and sold it the next year to the Risap Corporation (James A. Knott, president)." 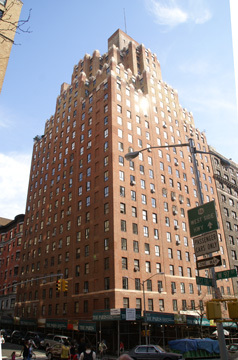 It also said that Henry Mandel said he converted it into "middle clcss housing" and that he sold it in March 1981 to Amos Kaminsky's AFA Asset Services Inc., and that The New York Post reported that the building was sold Setember 28, 2007 to Westbrook Parnters for $85,787,799.